One of the benefits of growing strawberry plants is that they don’t die off every year. With appropriate care, they can live for many years, and they can survive very cold winter temperatures. These traits make strawberry plants hardy perennials. As the temperatures drop in the fall or winter, strawberry plants undergo a transformation. They slow their cellular processes, move into a state of plant “hibernation,” and are dormant until warmer temperatures return in the late winter or early spring of the next year. 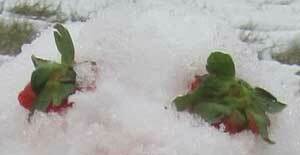 When temperatures increase, strawberry plants revive and begin increasing their plant metabolism. But, a brief period of warmer temperatures can happen before the warmer weather is consistent. And, unfortunately, strawberry plants are susceptible to being damaged by cold temperatures if they are not prepared for them. When temperatures rise and revive dormant strawberry plants and then precipitously fall again, strawberry plants can suffer cold injury or “frost damage.” This post will guide you through the process of determining the degree and significance of cold damage on strawberry plants in your garden. Strawberry plants and cold injury are common partners. Any time a plant survives the winter months, the late winter fluctuations in temperature put such plants at risk of freeze damage. And, while some damage is common, it is important to determine the extent of such injury. A small amount of temperature-induced damage will not kill your strawberry plants or significantly decrease their strawberry production if the plants are otherwise healthy. So, determining the extent of any cold injury is critical. After a cold snap, it can be critical to check a sample of planted strawberry plants to determine an appropriate course of action. If extensive damage is found, replanting your strawberry beds may be necessary (you can purchase some here, if needed: strawberry plants). If your region experiences a warm period followed by a significant drop in temperature, checking your strawberry plants may be in order. After the cold snap, wait a few days. Then, gather some simple tools. After you’ve gathered your tools, go to your strawberry bed. Use the trowel to dig a circle around the strawberry plants you are going to examine. You only need to inspect a few strawberry plants. After the circle is dug, gently lift the plants out, shake as much dirt and debris off of the roots as possible, and then cut or pull off all the leaves. All that should be left is the crown and some roots. Put the crown on your wooden block or other cutting surface. Then, carefully make a vertical slice from the leaf end down to the root end of the crown. This should cut the crown cleanly in half. The crowns will often be firm, so be careful when cutting as a slip with sharp cutting tools can cause personal injury. Immediately upon completing the cut, inspect the strawberry plant. As soon as the inside of the strawberry crown is exposed to oxygen in the air, it will begin to oxidize and turn brown, so swift inspection is required. Waiting too long to inspect will result in difficulty accurately assessing the extent of strawberry damage. 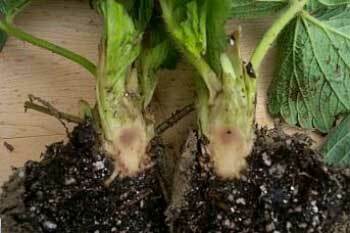 When inspecting strawberry plants, look for brown discoloration within the whitish, ivory-colored inner crown tissue. If light brown discoloration spots are visible, the strawberry plant has suffered mild cold damage. 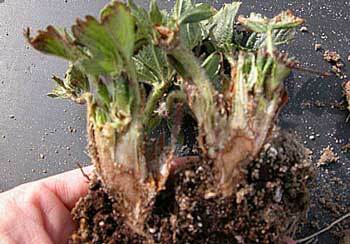 Mild cold damage on strawberry plants is usually insignificant. The strawberry plants will adapt, heal, and continue their normal and productive lives. However, if brown streaks or significant browning are noted, the strawberry plants have suffered more extensive damage, and the strawberry plants may have to be replaced. Prior to digging up your entire bed and replanting, it is a good idea to wait a few weeks and recheck a sample of the plants. Upon recheck, if new white areas are developing within the crown, the strawberry plants will often recover. If there is no new white crown tissue, the plant is likely a goner. At that point, replanting the strawberries will be required.